By default WordPress Creation Kit saves the Custom Fields in a Serialized Array. When used like this it enables for that Custom Meta Box the unserialized_fields option. When enabled, besides the Serialized Array that is normally saved, each individual field will be saved in it’s own meta, regardless if it’s a Repeater Custom Meta Box or Single Custom Meta Box. * Where $n starts at 1 and represents the number of the entry in the Repeater Custom Meta Box. For a Single Custom Meta Box it will be 1. You can download and install this plugin to achieve this without writing code. 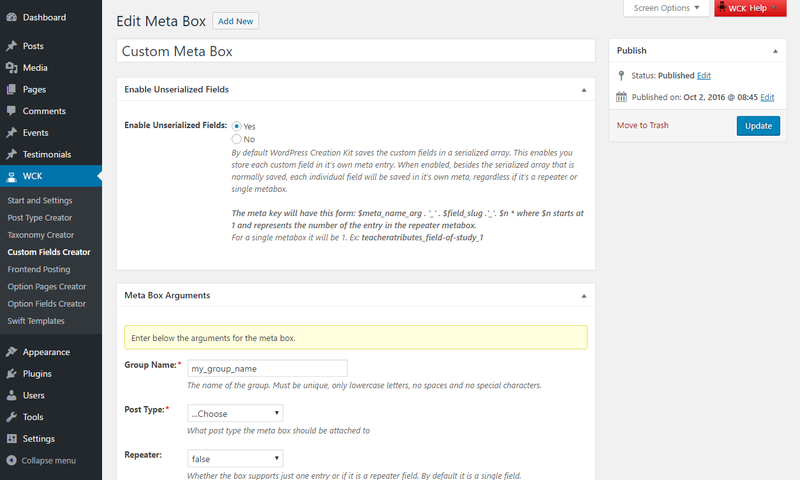 You’ll get access to a new Meta Box in your Custom Meta Box called “Enable Unserialized Fields”. If you enabled this feature AFTER adding content in your Custom Post Type and Meta Boxes, please re-save it (Edit -> Save Changes) on EACH individual Meta Box where you have Unserialized Fields enabled.